Information about your biological samples, accessions or strains can be stored as text, number or date. The input of information is streamlined and harmonized by the use of pick list and flexible import routines. Use calculated fields to dynamically combine stored information into e.g. addresses or descriptive sample codes. Any information is quickly retrieved by the lightning-fast search functionality. Using Views, the data is filtered and presented exactly as required for any application. Documents, images, urls or long text are stored as attachments with any database object. Use the build-in functionality to take full database backups and easily restore databases if needed. Avoid unnecessary duplication of information by structuring databases in hierarchical levels and by creating one-to-many dependencies between database entries on different levels. The concept also provides a flexible solution to deal with replicate measurements. Keep related information organized by using cross-links. BioNumerics’ advanced client-server system is the perfect solution for collaborative research projects, networks, and private initiatives of any size, where central databases are made available to a restricted or unrestricted number of client users. Each BioNumerics software package comes as a client version, which can connect and communicate with a BioNumerics Server using TCP/IP. A connection is established between the Server and the Client, allowing uploading and downloading of database entries, interactive querying, and automatic identification of profiles uploaded by the client. Using the script language both at client and server site, sophisticated implementations can be designed. Examples include automatic creation and broadcasting of reports and notices, or automatic alerts of members in surveillance networks. BioNumerics can be linked to an ODBC compatible high performance database management system (DBMS) such as Oracle, SQL Server and MySQL. This allows a setup where multiple users can access the same database simultaneously. BioNumerics users can exchange information at a peer-to-peer level by simply making a selection of database entries, and clicking the information fields and experiment data to be exported in XML format. Received XML files can be imported and directly analyzed together with other database entries. BioNumerics automatically recognizes which experiments are compatible. XML exchange files can optionally be compressed and encrypted. 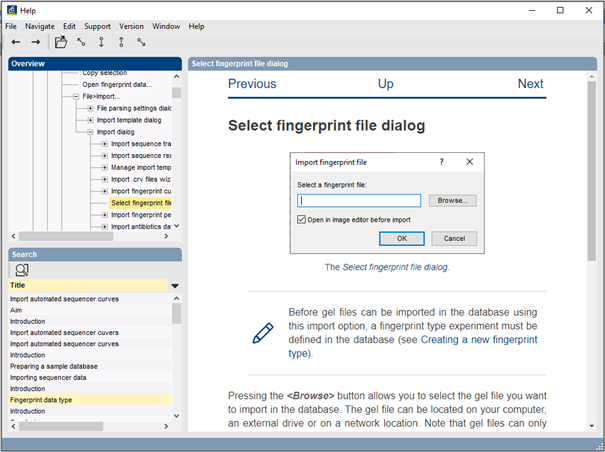 Any selected information and experiment data for selections of entries from the database can be condensed into a Bundle. Bundles can be exchanged over internet and opened in a recipient database. Automatic remapping makes full comparison between different fingerprint systems possible. In many research projects, especially epidemiological, biological data is closely linked to geographical data. 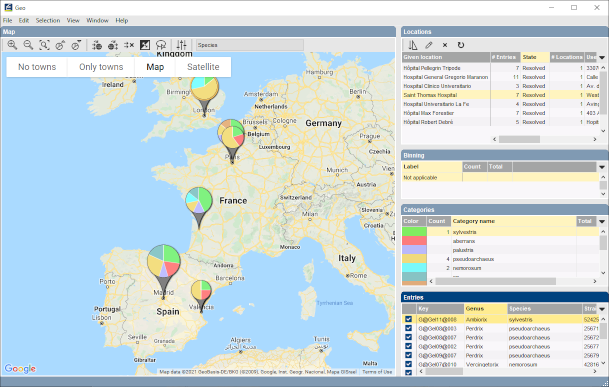 The BioNumerics Geographical mapping plugin offers a simple yet powerful way to map the results from queries, comparisons, identifications, etc. on geographical maps. Geographical information of database entries can be provided as addresses or as geographical coordinates (longitude & latitude). Locations can be plotted as dots, bar graphs or pie charts. The powerful geographic tools of Google™ Maps and versatile search, select, and query interface of BioNumerics together make the Geo plugin a very useful and interactive asset. 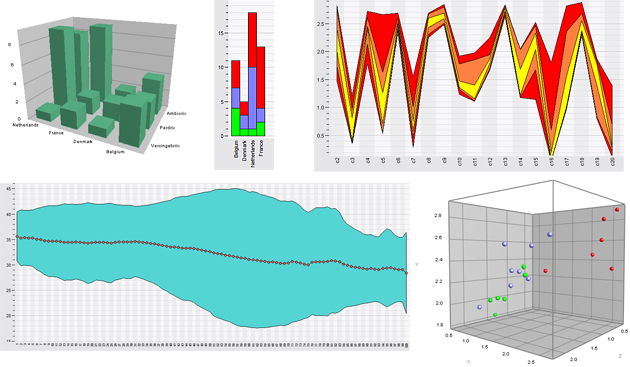 Create any kind of chart, such as bar graphs, frequency bar graphs, scatter plots, contingency tables, pie charts, ANOVA charts, etc. based on information fields or experimental data. BioNumerics is a very comprehensive software package, containing a large number of specialized algorithms, each with their own settings and options. Via a convenient help button, present in every dialog box or via Help > Help on window, adequate help and guidance on which options to choose is just a mouse click away. The online help can be searched using keywords and navigated using a convenient tree representation in the Overview panel or via hyperlinks in the text. In case BioNumerics is installed on a computer without internet access, help files can be made available locally from a zip archive included on the installation DVD.